We were in the mood for pizza this past weekend so we decided to head to Gourmet Pizza Company in SoHo at the corner of Swann & S. Armenia. 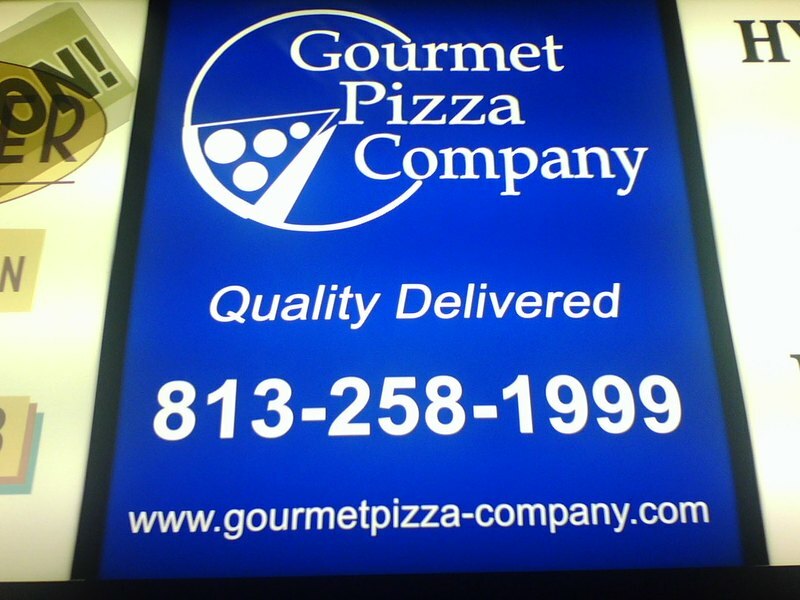 As the name implies, Gourmet Pizza specializes in pizzas with gourmet toppings. Everything from center-cut rib eye to crawfish tails. While most folks get their pies to-go at Gourmet Pizza Company, we decided to eat-in this time. On our two previous visits to the small restaurant we had gotten our pizzas to-go. On this visit we ordered one custom 12-inch pizza with pepperoni, sausage and caramelized red onions and a 12-inch chicken smoked gouda pizza. This second pizza is one of Gourmet Pizza's speciality pizzas and comes with gouda cheese, grilled chicken, onions and crumbled smoked bacon pieces. The two pizzas were more than enough food for Traci and me, but we also ordered some breadsticks which had been delicious on a previous order. Unfortunately, this time the breadsticks had more of a rawish dough taste to them. The breadsticks were dripping in delicious butter and cheese like before, begging to be eaten, but we couldn't get past the doughish taste and let most of them sit. As for the two pizzas, both were tasty, and loaded with fresh toppings. Maybe it was because I already had dough on the brain, but I noticed more of a doughy taste to the crust than I had before too. Don't get me wrong, though. These were still two good-tasting pizzas and I boxed up what was left for home. 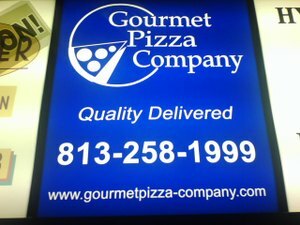 While the place isn't perfect, I'd rather order a pizza from Gourmet Pizza all day long over the chain gang of Papa John's, Domino's, Little Caesars and even local chain Westshore Pizza. Other local pizza places I've tried include Galley Pizza on S. Westshore, which does a pretty good pizza, and Sally O'Neal's on S. Howard, where I found the pizza and service to both be pretty mediocre. So what's your favorite local pizza joint? Bottom-line: If you're looking for a unique twist on your next pizza, Gourmet Pizza Company in SoHo is worth checking out. They deliver downtown and throughout most of south Tampa. Inspection Scorecard: Last Inspection: September 2006 violations - Critical (12), Non-Critical (4).